The party bus Ybor City service that we offer is beneficial when you are looking for a fun ride around town. Our party buses can be hired for different occasions. When corporate teams need to get transferred to a destination in a group, nothing will make their journey more enjoyable than opting for one of the 20-50 passenger party buses that we offer. Have questions? Call 813-514-6980. The party bus rental Ybor City service of our agency is reputed and well known in the region. If you are a local and need to get a transportation arranged for a wedding party or a bachelorette party, you can take a look at the luxurious limo buses we offer. They are of different make and styles. 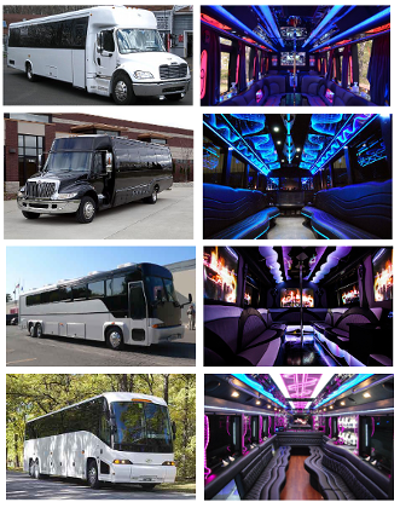 The party bus rentals come with VIP rooms and lounge area settings. Again, the kitchenette area also makes it convenient to have party beverages and snacks offered on the run. The party bus Ybor City service is booked through the portal of the agency. You will find all the limo models described here, about 30 passenger party buses and more. You can hire several buses from our site and avail of discounts and special offers on bulk orders. The party bus rental Ybor City booking is completed when you provide all the necessary details, agree to the hiring terms and then proceed to complete the payment for the same. Hire our party bus rental service now, 813-514-6980. Ybor City Market; it is a local marketplace to check out and buy local produce. Cigar Industry Tour; this is a tour of a different kind for the tobacco lovers. Anywhere Tours; opt for a guided tour through them. Acropolis Creek Tavern; visit this place for drinks in the evening. Alâ€™s Finger Licking Barbeque; it is a place where you can try different grilled cuisine. The airport visits or the shuttle service to the nearby Tampa International airport for large groups of people might fall expensive when separate shuttle cabs are used. We have shuttle services offered through our party bus Ybor City service. You can avail of the same and save on costs when getting a group to the airport on time. The party bus rental Ybor City service comes of use when you wish to undertake a long road journey to and from Ybor City. The city is connected with several nearby cities and towns like Tampa, Plant City, Citrus Park, Pinellas Park, Brandon, Oldsmar, Safety Harbor, Bloomingdale, Lutz, and Temple Terrace. The several models available among our 50 passenger party buses will help you get to your destination in comfort and luxury.